Info: Created on 14th October 2010 . Last edited on 6th November 2010. Advice on spacing needed. Thanks all. Congratulations! FontStruct Staff have deemed your FontStruction worthy of special mention. 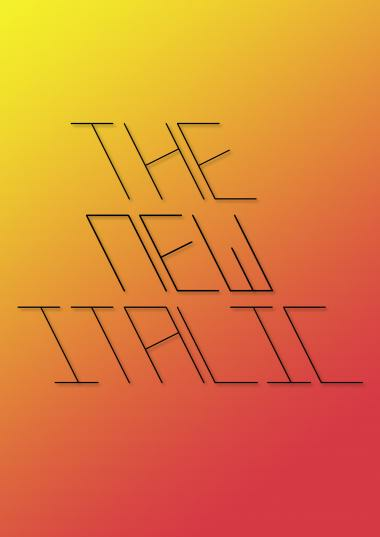 “The New Italic.” is now a Top Pick. wow thanks, hopefully it works on everyones pc's properly. So simple and so stylish! The sample proves it. A little bit too much space to the “full stop“ and the “comma“ and they don't fit perfectly to the style of this cool font, but you should definitely add numbers and punctuations. Btw, the middle stroke of the 'W' isn't right in the middle, but maybe it‘s supposed to. Damn, why did someone gave this a 1/10 !? i do need to fix the full stop and comma that is true. but i think the middle stroke in the W was suppose to be like that. It is suppose to be to the same height of the bars on letters such as e, f, p etc. Thanks for the feedback! No, that's cool like that. I actually meant horizontally not vertically. hey nice job. might have a hard time trying to distinguish some of the letters from others such as the u and v.
Wow I really like it - nice clean tight design!